Well...Have I got the perfect starter tool for you! In all honesty, I can only juggle about 3 tools at a time. Any more than that, the kids forget how to use it (time wasting). 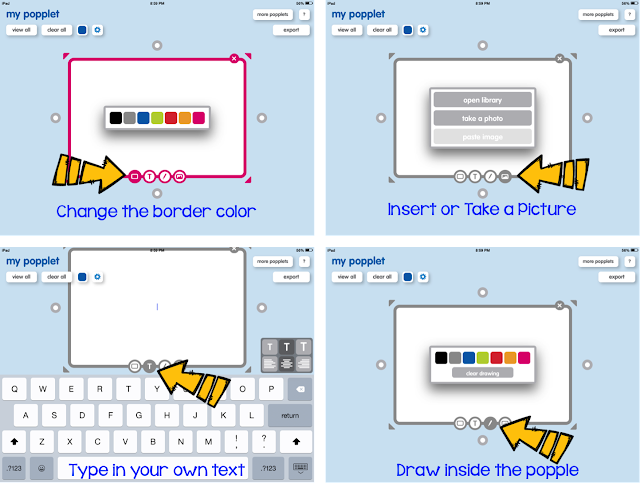 Symbaloo and Padlet are the biggies for me. Once my kids are proficient in those, I can bring in something else. It is available in both web-based and for iPads. 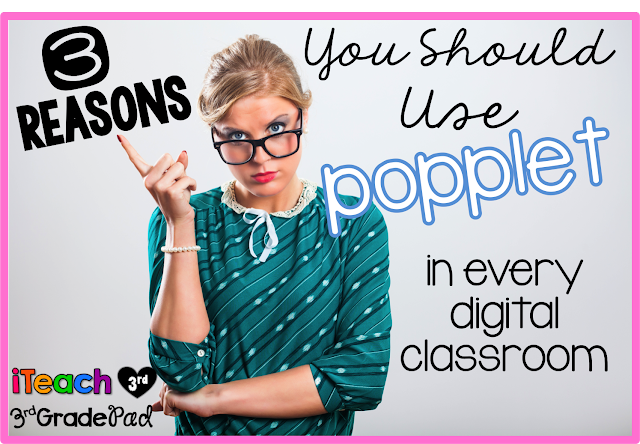 ANY classroom with digital access can benefit! Ready to be convinced? Here goes! 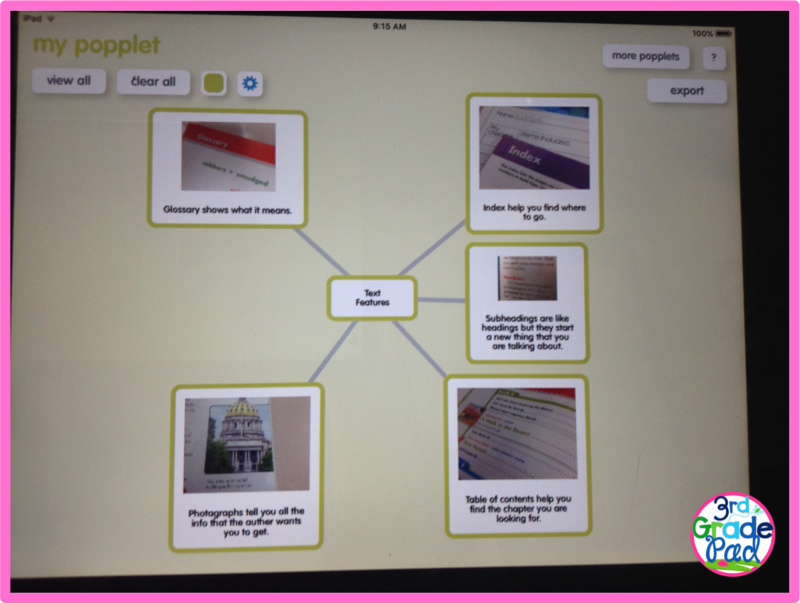 I promise you…there is nothing SIMPLER than Popplet! Double tap anywhere and POP! You have your first popple. Tap on any of the settings below to create the popple of your choice. See the little white circles? 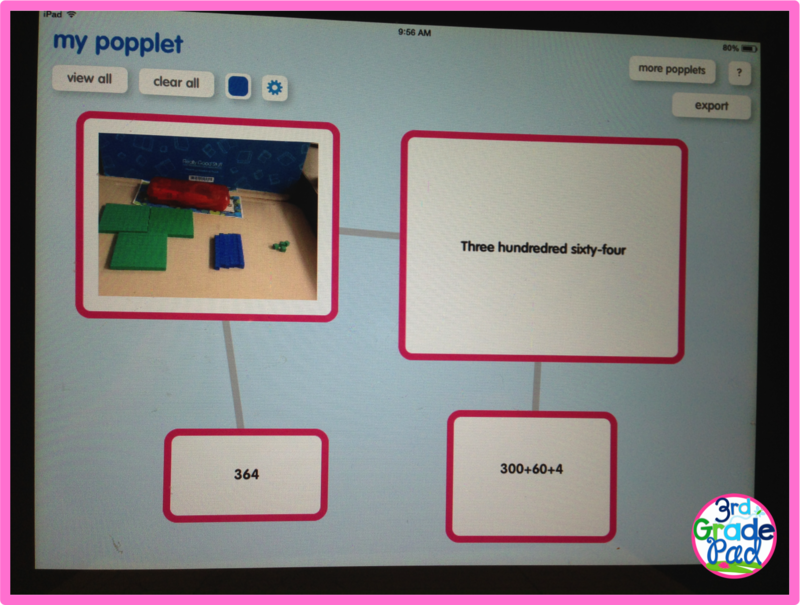 Simply press and drag to create an ATTACHED popple. This graphic organizing tool can easily be used across the curriculum! 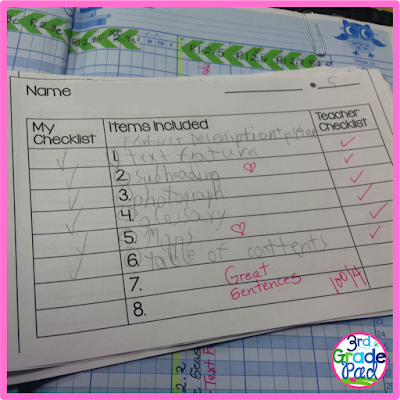 This week, we located examples of text features. 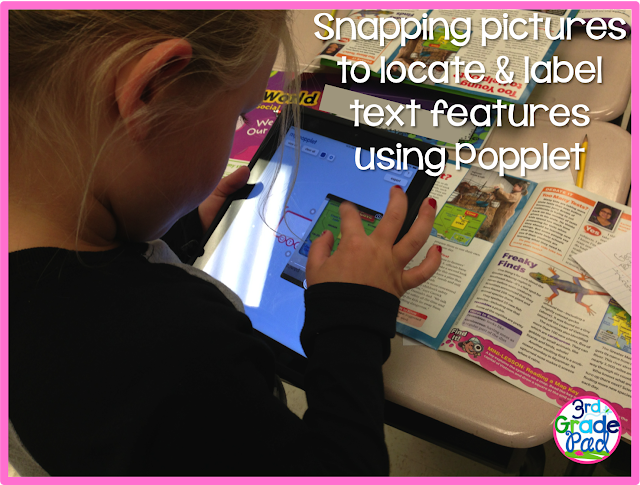 They took pictures using their iPads and added text to label & explain the feature. Talk about actively engaged! One of my little buddies asked to make a popplet about our reading. Can't you see kids working in groups making different presentations for the class to EXPLAIN what they researched?? In math this week, we were working on place value. Would this make an AMAZING center activity! No copies..no laminating. Roll three dice and GO! This could also be used to show different parts to create wholes, different expressions to express a number--the number of digits will depend on your needs! 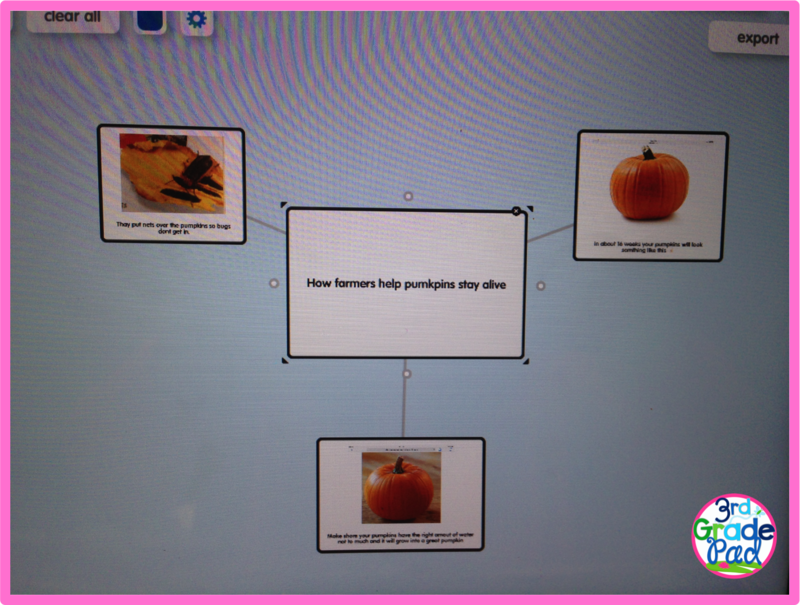 For science & social studies, students can respond in so many ways to show understanding! Learning about types of rocks? 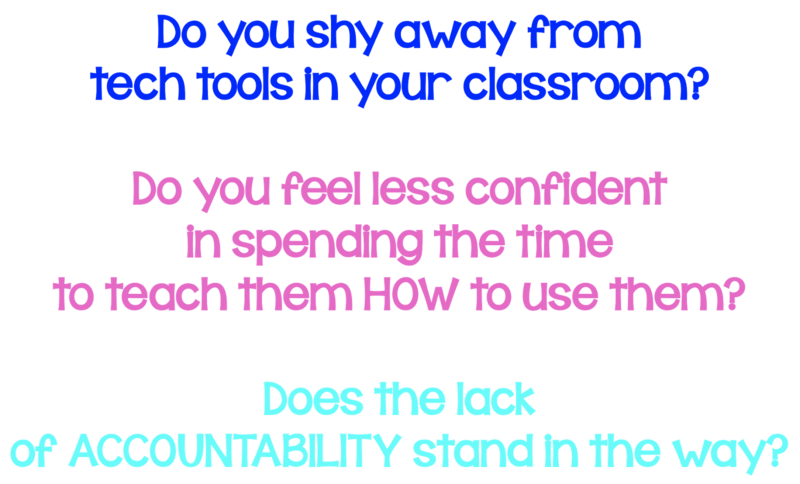 This is all fun, but it is important that the students are focused on the task. 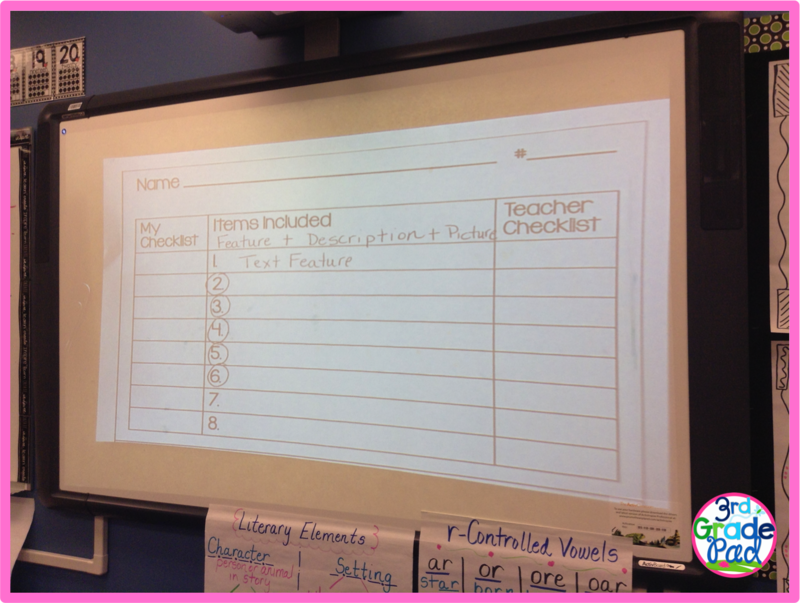 I give my kids an easy rubric so that they stay on track. Since this is one of those tasks that the parents DON'T see, I add two places to check off. 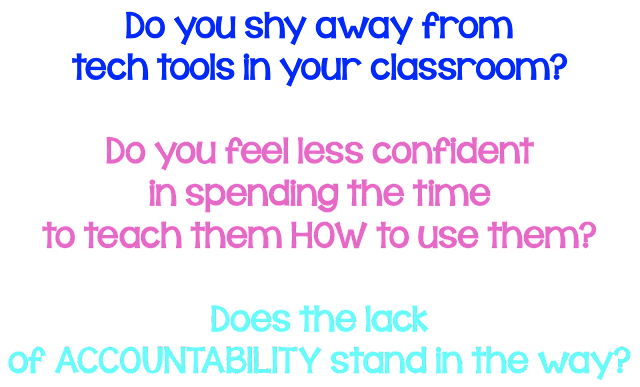 One is for the students--this is their promise to have double checked what is expected. The right side is for me to do the final check. Kids on iPads can take screen shots or you could check them off personally. I like the chance to discuss and help them make improvements-clarify their thoughts. When I can, that is! Despite the fact little buddy has HORRIBLE handwriting…yes, I WILL be using some of Melissa's tips for this guy, but…He had done an AMAZING job! Do you give your kids feedback when they do an amazing job? I like to give them hearts. Love hearing when they look over their papers and are excited when they earn a COVETED heart! I'd sure love to hear how YOU use Popplet…or if you TRY it! You inspired me. I am going to try this when school starts back.